Thearica, who blogs at Pig Tales and Quilts, is an experienced long arm quilter and today she will share ideas and thoughts on long arm quilting. 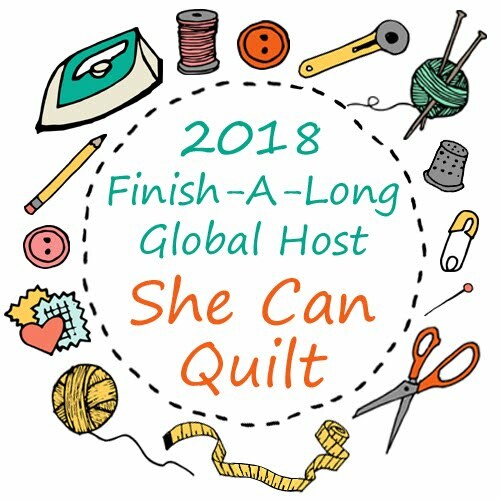 Many of you know that I came home from QuiltCon dreaming of owning a long arm quilting machine and these insights only make me want one more, I am sure you will enjoy them as much as me - read on. Hello, my name is Thearica Burroughs and I hang out over at Pig Tales and Quilts. 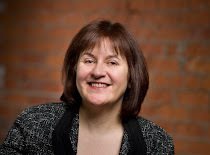 I want to thank Leanne for sharing her blog with me today! 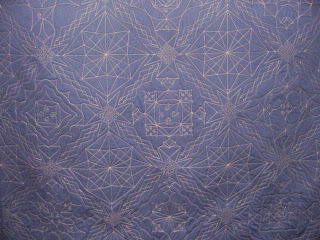 I am a 33 year veteran hand quilter who, because of carpal tunnel, had to turn to machine quilting in 2001. It was very daunting at first because no matter how I tried, I could not quilt to "suit myself". I finally let the machine just sit. My husband finally asked me if I was going to quilt on it or just look at it. That is when I knew I had better do something with this $10,000.00 piece of machinery since he had purchased it for me. 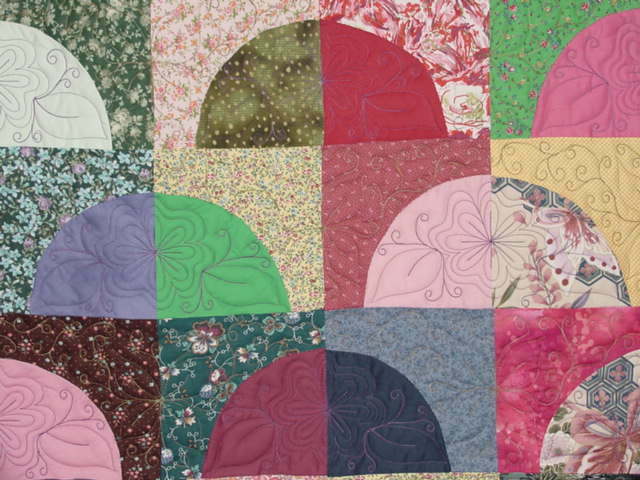 I went online and searched for any longarm quilting classes I could find nearby. I was lucky enough to find one in West Virginia, fairly close to where I lived. I signed up, paid my fees and got excited about the possibility that I would learn to use the machine. Nichole Webb was the instructor and she was fantastic! I learned so much in that first class that I hosted her in my home 3 months later. 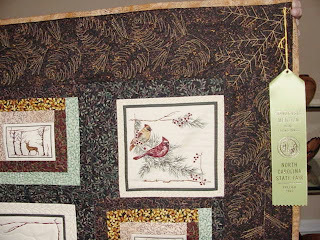 I also took classes from 3 more very talented instructors, including Sherry Rogers Harrison, Sue Patten and Karen McTavish. If it were not for these 4 instructors, I would have eventually sold the machine. 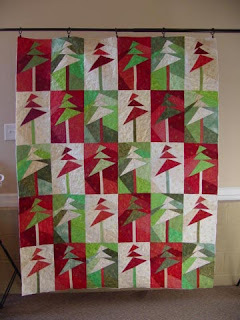 I am here to tell you that if you are a beginner longarm quilter, take classes. If there are no classes near you, then go to some of the bigger quilt shows where you will find these instructors and others just like them. The knowledge they have to share is far worth many times over what they charge for their classes. I am confident that you will walk away with a whole new arsenal of knowledge to use in your own studios. I also want to say, don't be scared to spend a little extra money on books that these instructors publish. A lot of them will come with a DVD and you will reap so much from these learning tools as well. 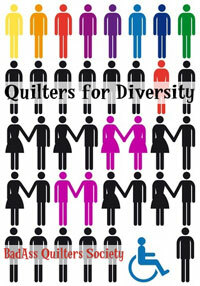 One of my favorite books is "Quilting Makes The Quilt" by Lee Cleland. I have used this book more in my quilting than any of the others in my library. I also love Patsy Thompson's DVD's. These are a must for every longarmer's library. 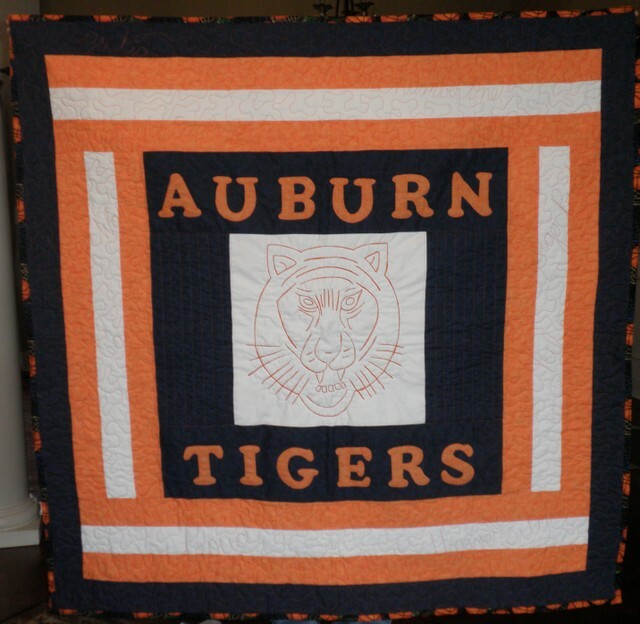 They are full of fun quilting designs that your customers will come to love and expect on their quilts. 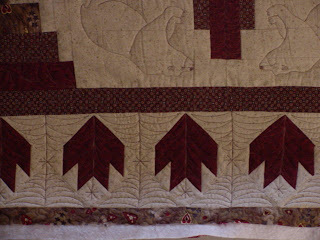 I quilted feathers in the following quilt using Patsy's hyper quilting style. The customer entered the quilt in a show and we won 2 ribbons! It is one of my favorite quilts and was really fun to quilt! My motto is" You HAVE to HAVE your tools"! I want to discuss how I approach my own quilting. Applique quilts... 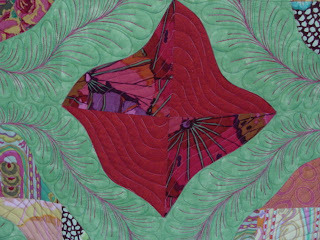 I like to quilt within the applique to "fine tune" or "finish" a design...such as veins in leaves, designs in butterfly wings, and quilt in the open space around the applique to "enhance" the design...such as butterflies flying, bugs sitting on top of a flower petal, snowflakes falling...the ideas are endless. The following photos show where I have added details such as the quilted flower up under the embroidered bumble bee so it appears he is sitting on the petals. 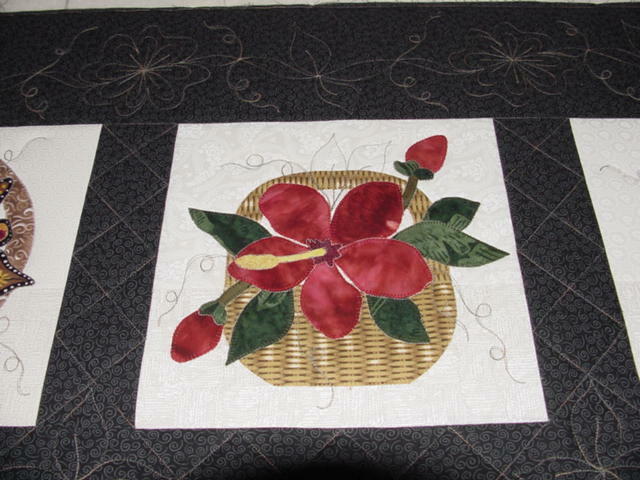 Just let your imagination take over when you are quilting applique quilts. Let the child inside you take over. Pieced quilts....these require more decision making than any quilt will. The choices are endless and you could quilt the same quilt 6 times and never quilt it exactly the same with the designs available today. From filling HST's with feathers, to doing Continuous Curve or Terry Twist in squares and Line Dancing in triangles, the designs are endless! Leaf wreaths and feathers wreaths are magnificent in solid large squares! A curling vine with tendrils and leaves makes for a beautiful border. Just make sure that the quilting inside the quilt and in the border compliment each other. 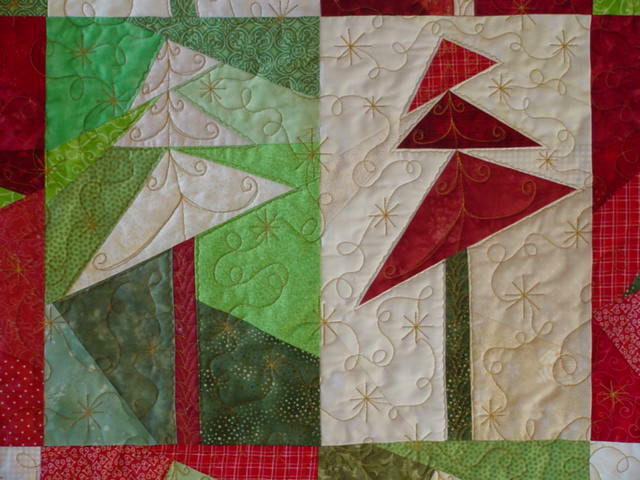 This Christmas quilt was done for a customer and I quilted snowflakes all over the background. I used Signature 100% cotton thread in Mustard color and when I finished quilting the quilt, it looked like a metallic Christmas card. Always remember that your thread color plays almost as much a part of your "finished" look as your quilting design. 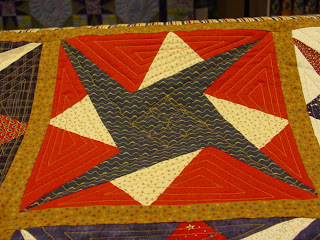 Mustard thread is wonderful on Christmas quilts and red/white/blue patriotic quilts. I remember when my friend Regina Carter suggested I use mustard on this Christmas quilt, ...I wasn't so sure... until I took the quilt off the frame. I am now hooked... line and sinker on mustard. I turn to it more in my quilting than any other color thread. Try to keep your design choices to 2-3 to a quilt. 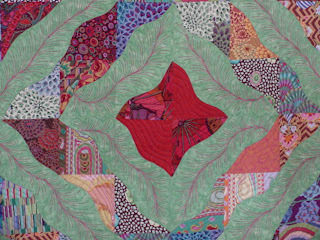 When you try to incorporate too many designs within one quilt, it starts to lose its wow factor. 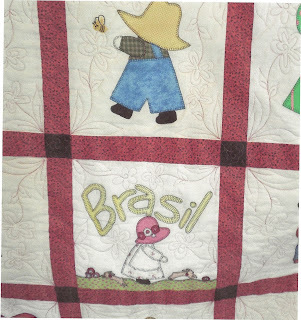 This is one of the quilts I remember enjoying from the first stitch to the last. I quilted a pretty little flower in the half circles and filled in the background with a trailing vine with tendrils. This is low end custom but gave this vintage quilt just what it needed to bring it alive. 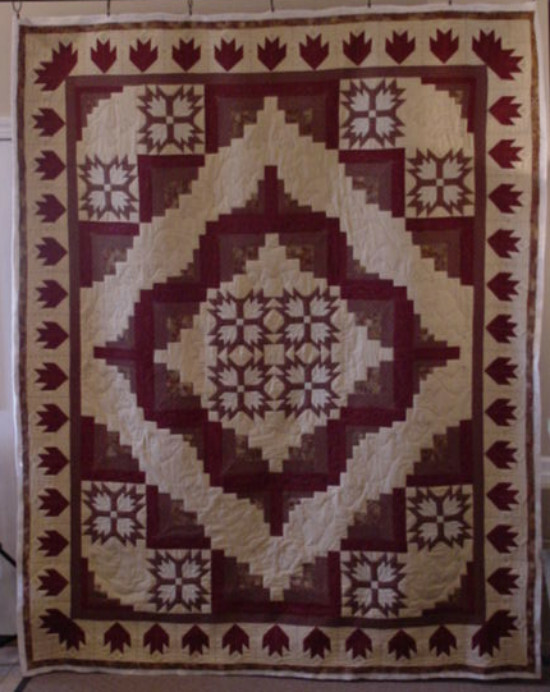 The customer's grandmother had pieced this top many years before and now she is able to enjoy it finished. Marking tools are endless but my favorites are the Clover White Pencil that is easily removed with a spritz of water...and the Clover Fine Tip Water-Soluble Pen. I find that the Maurvy Water Soluble Markers bleed to the back too often or re-appear after misting with water. The ink gets trapped in the batting and eventually shows back up on the top. I despise troublesome tools and I have never had any trouble with the Clover products. 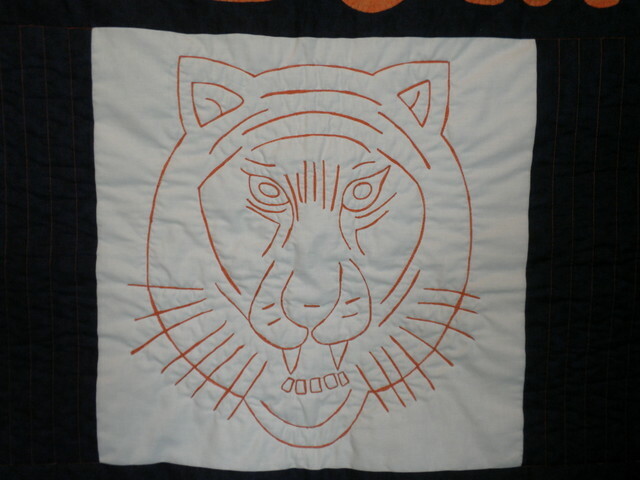 I made this quilt for my daughter's 30th birthday and drew the tiger's face on with my Clover pencil. 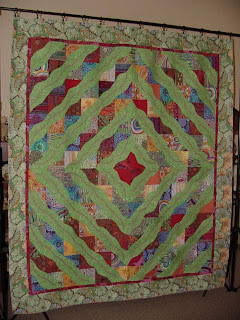 Once it was quilted, I just spritzed water right over my quilting and any marks showing were gone like a puff of wind. They come in white, pink and blue for any color fabric you may need them for. There are tons of rulers available. My favorite is the Accu-Glide by Donita Reeves. I use it for going around applique, quilting continuous curve, terry twist and line dancing. I also use it when doing background fills. I find that it steadies my hand for a more finished look to my quilting. You will need a stitch in the ditch ruler and my favorite is the Dainty Ditcher by Sherry Rogers-Harrison. Circle rulers are a must for quilting wreaths. It is good to have a nested set so that you have several sizes at your disposal. 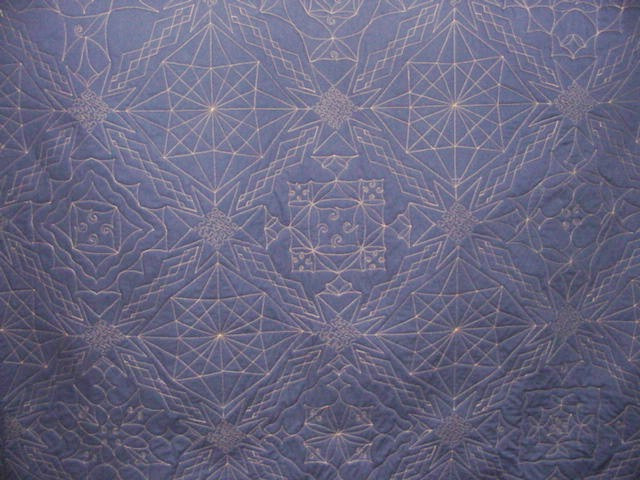 This is the backing of one of the largest quilts I quilted using rulers. You can see just how much work went in to this quilt and how the quilting design just rocks this back! Do not be afraid of rulers. I would urge you to invest in an Extended Base if you plan to do a lot of ruler work. It will save your sanity! Do not get caught up in the concept that all quilts look great with feathers and all old favorites look good with the Baptist Fan design. Quilt the designs that are not usually seen on your customer quilts and your quilting will stand out from the rest. As much as we all would love to load a quilt and begin quilting immediately in order to get the most use of our time, it is not the way to get the best use of your time. When you are willing to sacrifice a little of your hourly earned wage for your customer, they will be awed with your quilting and become a "return" customer for sure. Remember, a rushed job looks like a rush job! 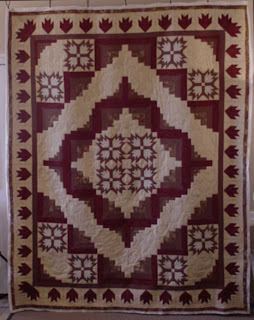 I will hang a top that has come in to the studio and study it for at least 3 days while I quilt on another quilt. I will photograph it and upload it on my computer. You have no idea how this will actually allow you to see the quilt top differently. 2nd and 3rd design opportunities will jump out at you. If you approach the quilt in a "treasure hunt" way, you will see the "hidden" potential. I love to quilt someones top using a "hidden" design feature that you normally do not see when you first look at the quilt. That is when you will see your customers eyes pop open, the smile come to their lips, and you know you have done your job well! Another quilting design opportunity may lie within the fabrics that the top is made from. Look at the fabrics... Do they speak to you? Are there designs in the fabrics that you can bring out in your quilting? The possibilities are endless if you know what to look for. This is where you will train your mind to look for what you normally would not see. This is one such quilt where I played off of the pine cone designs in the fabrics. I pulled that out to the border for a WOW! factor! You can see the judges thought it was a perfect idea! 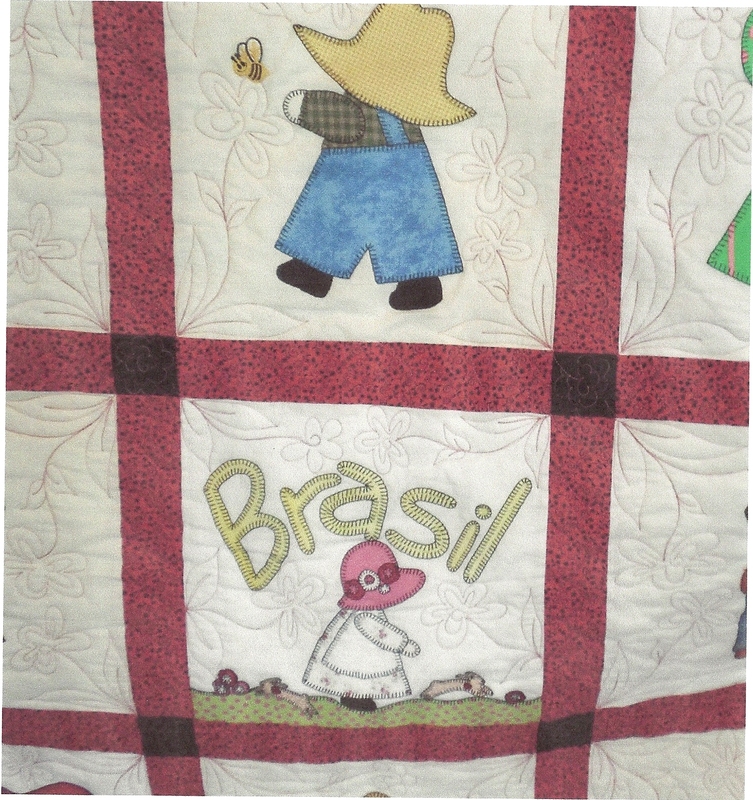 This quilt was quilted using designs inspired by the name of the pattern and for the name of the cabin that this customer's daughter owned in the mountains, which was going to be home to this quilt. 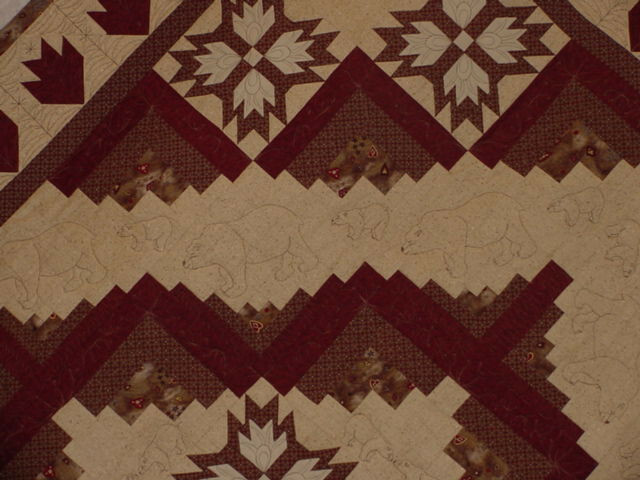 The name of the pattern was Shadow Of The Bear and the daughter's cabin was called "Bear Cabin", hence you will see bears and bear claws quilted within this quilt. Last but not least, is the drawing pad. I have been told by a good friend, a fellow longarm quilter, that it takes 100 hours for you to train your brain in quilting a design. Repetitive drawing and/or quilting of any one design will eventually allow you to quilt this design without the aid of drawing. I drew on my quilts a lot when I first began but now I find I need only to draw registration places and I can quilt free as a bird. It just takes time! Be willing to give yourself the time to train. These hours don't come from just drawing on a pad but also standing at the machine. The more you practice, the better you become at what you do. Isn't that true of anything? My advice is to load a play quilt, or ask your friends if they have some quilts they would be willing to let you practice on. Load it and be ready to quilt. 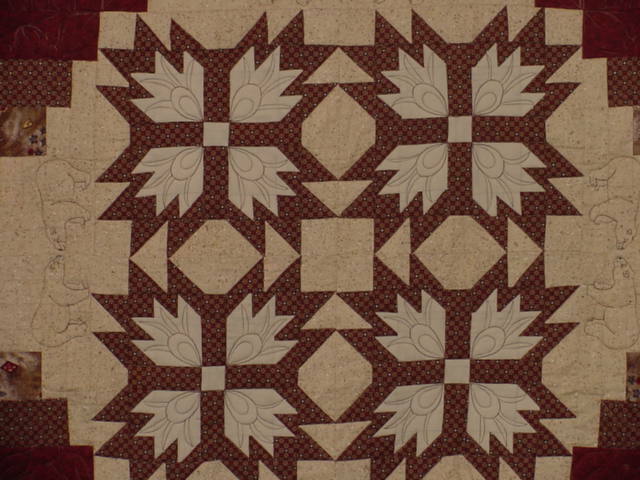 Study the quilt for several minutes and decide on a design you would like to quilt in one of the blocks. Now, go sit down for 2 hours. Yes, 2 hours... get out your pad and draw the design you want to quilt. Draw it over and over again. Draw it until you think your hand is going to fall off. Draw it until you have it drawn like you want it. It might take 2 pages of paper, it might take 20, but draw it until you are comfortable with how it looks. Then trace over that drawing. Trace it again and again. Just zone out.. possibly have some soft instrumental music playing low in the background. When the 2 hours are up, go to the machine and quilt it right then. You will surprise yourself. Practice, practice, practice. I cannot emphasize how much this will benefit you. To become the best quilter you can be, you must be willing to study, study, and study harder! Don't ever settle for where you are at this moment in time. Always want more from yourself and you will shine above the rest! By taking the time to study and taking the time to practice, you will find yourself becoming more confident than you ever thought possible. But it won't come free. You will have to dedicate hours to yourself to make it possible. And always remember "Rome wasn't built in a day!" Helpful links for todays longarmers: http://www.longarmuniversity.com http://www.longarmsupplies.net http://columbiariverquilting.com I hope what I have shared with you, has helped in some small way. I also offer classes in my studio and welcome you to contact me for more information. 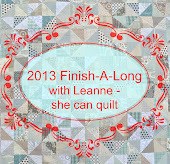 Thanks again Leanne, for allowing me the opportunity to share what little knowledge I have on longarm quilting. It has been fun! Thank you so much for this post. I especially appreciate your advice about marking tools and the link to AccuGlide rulers. I let my machine sit for a long time because I was scared to begin, mistakenly thinking that I should just be able to freehand an entire quilt without marking. I don't know where I got that idea, but I am now happily working on my skills! You will love the AccuGlide ruler. It is my "go-to" tool. I don't think I will ever own a long arm - i haven't the spare cash or the space to keep it! But this was so interesting to read. I hadn't even *considered* you would have to mark quilting lines. I don't know why since I draw straight lines when I quilt on my domestic machine! So now I'm wondering if I should have a go drawing some guides and having a go at a different free motion design than stippling. I think I just assumed everything was eyeballed and it was skill (instead of skill and lots of practice! ) that made a great longarmer. Your designs are fantastic! I can't get over the pine cones and bears. This has really been an inspirational post for me even though I'm perhaps not your typical target audience! So thank you. You can certainly apply this to quilting on a domestic machine. I know several very talented and award winning quilters who only quilt on a domestic. Myself, I could never wrestle a quilt under one so I bow to those who can! What a wealth of information and such an interesting read! Thanks so much! Thanks for putting together such a wonderful post. You've given us so much information to draw from. I am a fellow longarm dreamer. Long arming sounds like something I would love to do. I was wondering if it is still fairly hand intensive. Things like gripping the handles and loading the quilt. And did you go directly from hand quilting to a long arm? Wonderful post, very informative and encouraging, thank you. Pantograph and low end edge to edge is not too hard on your body but full custom can really be hard on your back and your legs. They make a chair that you can quilt in called a side saddle. The belly bar of my Gammill lets down so you can sit and quilt. I have never used that option. Yes, I went straight from the frying pan in to the fire so to speak. It was very daunting at first but once I took the classes, it made it a lot easier. I had to make myself learn to repeat a few words every time I stood at the machine in the very beginning.. “If you can draw it, you can quilt it”. So at first I drew a lot of my designs on with my marking tools. This took a lot of extra time but the finished result was well worth it. Seasoned longarmers told me not to draw and told me I was wasting my time but I strongly disagree with them on that. it is the only thing that saved me from selling my machine. As time wore on and I got more confident I stopped drawing as much and started trying to quilt the designs on my own with a few registration marks. And now I can quilt most anything I want to. So if you are willing to give yourself the time you will need, you can do it too. 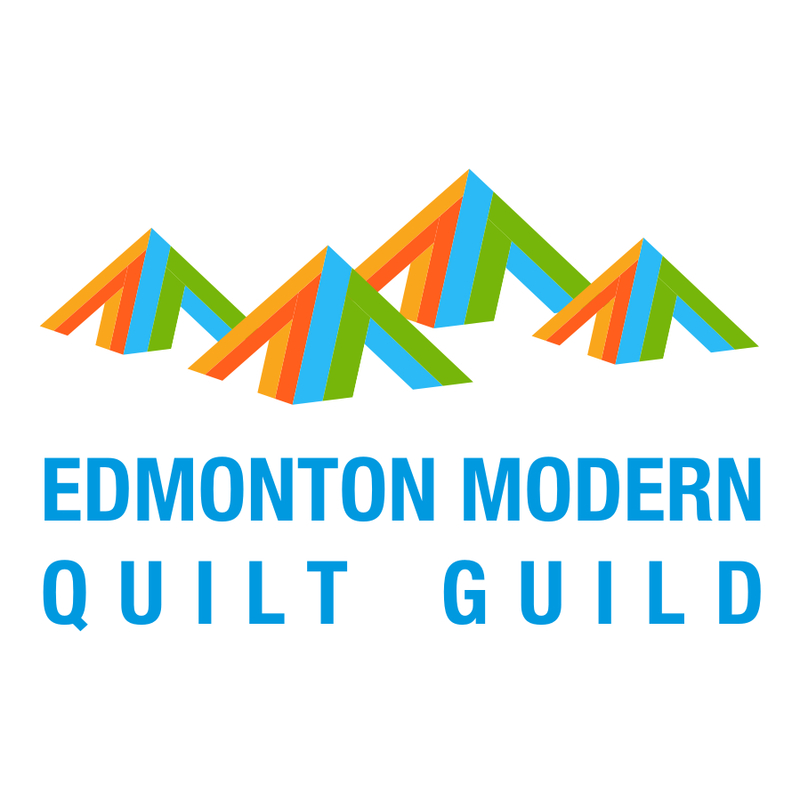 Very informative and can also benefit the short arm quilter. Sorry, my eyes began bleeding at '$10,000'!!! These machines are pretty expensive but they will last a lifetime if you take care of them. Wow, fascinating! I would love to be able to rent a machine one day and give it a go! I am not a longarmer - just a wanna be!! I enjoyed this post and even picked up more ideas for my domestic machine. Thanks so much. This was so informative. Her work is gorgeous. This post is so perfect for me....I'm picking up my mew-to-machine next weekend. I've actually printed it out to read over and over. Thank you so much for all the terrific information. I'm sure that I will refer back to it time and time again. I might not be a longarmer but I find this post very inspiring. Learning never had a pull stop...thanks Thearica for sharing your experience and the tips along the way! Beautiful work Thearica!! I have the Baby Lock Tiara coming in this week. It is the longarm with a table instead of a frame I don't have the space of a large frame. I too; as you know, am a long time hand quilter; and will continue with it. But I want to learn longarm quilting; so this is my way to get started. Your post is so very helpful....thank you.